The computer center provides a centralized computing facility to complement the teaching and research function of the Institute. Various software packages and graphic tools are maintained to facilitate the general computing requirements. IIF has developed a well equipped computer center supported by IBM 200 X and IBM Net finity 3000 based server with multiple Pentium nodes & stand alone PCs with Multi Media Facilities. Various software packages, financial packages & graphical tools are maintained to facilitate the general computing requirement. Peripherals used at present are HP Laser Printers,CD-RW, HP 3p Scan jet, HP Deskjet Printers, Dot -Matrix Printers, mouse & high speed fax Modems. 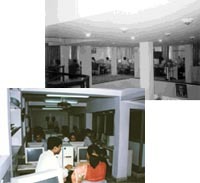 IIF Computer Centre also offers 24 hours Internet and E-Mail facilities to have an easy global access.